The Interior Ministry and the Security Service of Ukraine are instructed to secure gas, power supply and transport facilities. 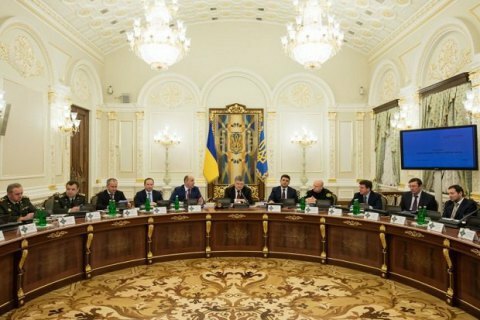 The National Security and Defence Council of Ukraine has instructed law-enforcement agencies to take measures to ensure public order in the antiterrorist operation (ATO) area in Donbas. The council's 16 February decision to this effect was enacted by President Petro Poroshenko's decree. The Interior Ministry and the Security Service of Ukraine (SBU) were instructed to take urgent measures to secure gas, power supply and transport infrastructure in the ATO area and ensure their safe and unimpeded functioning. "The National Police of Ukraine, the National Guard of Ukraine, the Security Service of Ukraine [are instructed] to ensure security and rule out, by legal means, any attempt at violating public order at critical infrastructure facilities… The SBU [is instructed] to urgently step up efforts to neutralize attempts by the Russian special agents, their agents and involved saboteurs and subversive groups to complicate the functioning of critical infrastructure facilities," the document reads.